Allyson Felix finally has the gold medal she always wanted. Now what? As she rounded the curve, Allyson Felix was all alone. She couldn’t see anyone. Not the other sprinters in the 200-meter dash at the London Olympic Games. Not her family in the stands. Not her coach. No one. She said when you’re in the race, the rest of the world is blotted out. And even if she could see, Felix didn’t have a second to swivel her head. Still, she could feel her competitors on her neck. She always starts slow — in the first 80 meters, she has to remind herself to pick up her knees and drive — but after a few strides, she uncoils into that full, elegant gait. And she always finishes with a burst. Good thing, too. Track is a cruel sport. Elite Olympic athletes train for a decade, with just a flash of time to legitimize their efforts. They get a chance once every four years. Those fleeting moments — in Felix’s case, the time it takes to fire off a short e-mail — occur under intense scrutiny. Then, they’re whisked away again. Most aren’t heard from for another four years, assuming they’re fortunate enough to qualify for another Games. Last August, less than a week after winning her first gold medal at her third Olympics, Felix met with Grantland for the first of a series of conversations about life after the Games. During the first visit, she discussed her previous Olympic experiences, the buildup and pressure of the event, and accomplishing a lifelong dream at 26. You can go from next to ex in just one Olympics. That nearly happened to Felix. The 2004 Olympics in Athens had been more about the experience than anything else. She was the prodigy, the next Marion Jones — when Jones was still viewed as a clean athlete. After graduating from Los Angeles Baptist High School, Felix bypassed running collegiately at USC — though she still attended school — to go straight to the professional circuit.. She was 18 years old and precocious, but her wins were predicated on talent, not technique. Watch out, experts said, if she ever meshed the two. With little experience, she still managed to nab silver in the 200 in Athens. Her coronation at the Beijing Olympics four years later never happened. She finished second again, behind Jamaica’s Campbell-Brown again. Felix had improved her time from four years earlier. But so had Campbell-Brown. She returned home and trained. Isolation is another cruel characteristic of track. There are no teammates in competition, only competitors. Often it’s just coach and athlete, athlete and coach. Felix had started training professionally under the demanding former Olympian Pat Connolly. During a layover, Felix once worked out in Paris’s Charles de Gaulle Airport as onlookers cast curious glances. Felix joined legendary coach Bob Kersee after Athens and trained with other Olympians including Joanna Hayes and Michelle Perry. She won three world championships in the 200, but couldn’t fill the void of not capturing gold on the biggest stage. She experimented with the 400, along with the 200, the race she has dubbed “my baby.” She dropped the former in favor of the 100, where a fast start means everything. That led to a frustrating predicament at last summer’s U.S. Olympic trials, when Felix and training partner Jeneba Tarmoh finished tied for third in the 100 and U.S. track officials had no elimination process in place to decide who would advance to the Olympics. Tarmoh withdrew from a controversial runoff proposed to decide the dead heat, allowing Felix to race in London’s 100. Kersee shielded her from the media controversy, and Felix clocked a scorching 21.69 seconds at the U.S. trials.1 On the day of the 200 race, Felix woke up, ate breakfast, watched some of the Games, and caught up on a few episodes of Scandal. She made sure to stay in a flat by herself, outside of Olympic Village. The day dragged on in anticipation of the race that night. Equal parts joy and relief washed over her when she crossed the finish line. “It’s like you’re constantly thinking about going after this medal and if it doesn’t work out, it just seems like everything is going to fall apart,” she said. She stood on the podium and reminded herself to savor the feeling, that it wouldn’t last long. After accepting her medal, Felix conducted a few interviews and underwent the mandatory drug testing. She joined her family. She took an ice bath and made one special request. She asked her brother, Wes, a former track star at USC working as her agent, for some Ben & Jerry’s Oatmeal Cookie Chunk ice cream. Track and field came to the forefront in the States when Los Angeles hosted the 1984 Olympics. Carl Lewis claimed four gold medals there, including wins in the 100 and 200. Florence Griffith-Joyner and Jackie Joyner-Kersee would later earn medal after medal. Before the 1992 Olympics in Barcelona, Reebok revved up its prominence with the infamous Dan & Dave campaign, highlighting the competition between decathletes Dan O’Brien and Dave Johnson and transforming them from anonymous figures into household names. (Dan & Dave failed to live up to the hype — Johnson could only secure a bronze medal in the decathlon, while O’Brien didn’t even qualify for the Games in ’92.) Michael Johnson set records in the 200 and 400 four years later at the Olympics in Atlanta. Jones burst onto the scene at the Sydney Olympics. It was 20 years of high time for track and field. But the sport has mostly stagnated — in momentum, marketability, and popularity — ever since. Several top athletes, like Jones, entangled themselves in doping scandals. American male sprinters hold no answer — or even a challenger — for Usain Bolt. Interest in the sport has suffered. Swimming and gymnastics have lapped track in the Olympic arms race. Felix, who is sponsored by Nike, is hoping to bridge that gap. She was one of track’s most recognizable faces in London, but what does that really mean? That face was being fretted over for an Essence magazine photo shoot. She’s had just over a month to get comfortable with the idea of forever being identified as Allyson Felix, Gold-Medal Winner by the time we meet again in mid-September. She’s returned home and spent a few days with her family and friends. It’s been a whirlwind, split between media obligations and the conclusion of track season — a couple of races in Europe. Though nothing will compare to the thrill of the Olympics, she established a course record of 22.35 seconds in her final 200 race of the season at the IAAF World Challenge in Croatia, cruising past Aleen Bailey and Charonda Williams. “It was a nice way to end off the season,” Felix said. The time represented an extended victory lap, an unfamiliar pose for Felix. She recalled the hopefulness after Athens and the despair after Beijing. She saw her family right after the race in China and felt like she’d unraveled before them. She vowed never to feel that way again. Felix was unsure whether she would have had the same motivation to win in London if she hadn’t lost the 200 in Beijing. Her parents keep it safe for her. If they have company over, they’ll pull it out and proudly show it off. Felix only asks for it when she has a speaking engagement. She’s got more than one gold to choose from — along with her gold, two previous silvers, and her first gold, earned in the 4×400 in Beijing, Felix also claimed gold in the 4×100 and 4×400 relays in London. Highlights from London’s 200 played on a massive monitor at Playa Vista Elementary. Felix was the guest of honor for a jog-a-thon in March. She sat waiting in a room while the students cheered her first-place finish. Felix has seen replays of the race only once in the seven months since the Olympics, and only because she’s been forced to do so for a media session. She’s critical of herself, even that 200. She can only think about what went wrong. There is no right, even with gold in hand. She greeted the students and delivered her message about the importance of exercise and diet. It’s the same message she delivered in Chicago at a February event she emceed with Michelle Obama for an initiative to improve nutrition and increase youth activity. Felix still can’t believe the First Lady knows her name. “I’m one of them,” Felix replied. She returned to full training in December. Those long, grueling workouts at UCLA have begun again. Felix acknowledged that while winning was satisfying, it isn’t the transformative experience one might assume. 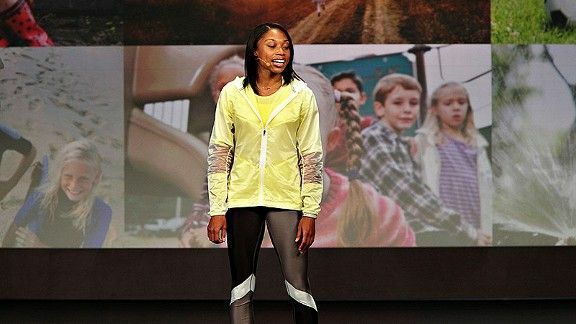 So, Allyson Felix has achieved the gold-medal dream. But she has more races to run. Next comes the World Championships in August, and later, the 2016 Olympics in Rio de Janeiro. She placed fifth with a time of 10.89 seconds in the 100 at the Olympics.